Can the R4 avoid the criticism levelled at its predecesor? These days it's a common trend amongst manufacturers to release new cameras with fewer and fewer differences from the preceeding model. Canon typified this when they released the successor to the EOS 20D. After all the pomp and ceremony, the main difference with the 30D model was a larger LCD and the addition of spot metering. So when it comes to compact cameras is the same process occuring? Enter Ricoh's latest offering, the new Caplio R4. Announced in February this year, the R4 builds on a similar formula to their older R3 model - revealed less than six months earlier in September 2005. It has the same physical dimensions, the same 7.1x optical zoom with vibration control and the same sized LCD screen... in fact, side by side, it would be nearly impossible to tell the difference. So what does this camera offer and has it really confronted any of the criticism aimed at its predecessor? The R4 enters a competitive part of the compact market place. Priced at just under £250, the main fl aw of its predecessor was the 5.2 megapixel sensor. So as expected, the R4 now sports a 6-megapixel sensor placing it on a more equal footing with the majority of the competition. However, like most cameras, purchasing decisions shouldn't be based solely on a megapixel count and the R4 does manage to come up trumps with some rather persuasive attributes. The R4's initial appearance is aesthetically pleasing even if the exterior shell feels a bit plastic. It's compact and light to carry around without becoming a burden and all of the switches and buttons are simply and logically laid out. The camera powers up quickly and is ready in shoot in a few seconds. Once on, its main feature isn't hard to miss with the R4 sporting a conspicuously protruding 7.1x optical zoom lens. The impressive (35mm equivalent) range of 28-200mm certainly makes this model stand out from the crowd, especially when most of the competitors offer 3 x or 5x zoom lenses with their equivalent models. One complaint levelled at the R3 concerned a flimsy lens covering which, in the new model, unfortunately still appears to be the case. That said the zoom itself performs reasonable swiftly even if it does sound a bit like a wheezing pensioner at times. The camera offers nine scene modes that can easily be selected via the menu option wheel. The usual portrait, landscape and night modes are all included but it is with its Macro feature that it really excels. 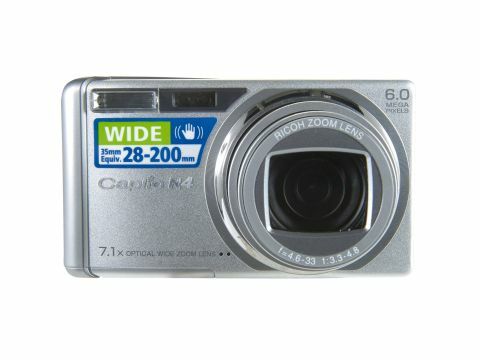 This function is incredible easy to operate, enabling users to get within 1cm of a subject or as close with the digital zoom option. Results are pleasing with crisp focus and good colour rendition. The shutter also delivers a good, responsive, performance with a lag time of under one tenth of a second. This worked particularly well in the sports mode, given that there is little room for error when shooting fastmoving objects such as motor racing. A previous gripe with the R3 was the poor quality of the 2.5-inch screen and thankfully this has been remedied. Ricoh has now upped the resolution from a paltry 110,000 pixels up to a more reasonable 150,000 pixels. Battery life has also been improved slightly although it performed admirably before. Ricoh states that the longevity has improved thanks to some special power-saving features of the internal circuitry. The camera now enables 330 pictures to be taken on a single battery charge, twenty more than the R3. The battery certainly lived up to this claim and performed exceptionally well in this review, lasting for more than three days of regular use. The R4's simply negotiated menu system is well aimed at the beginners' market and is basic but appropriate. Image quality is also more than acceptable especially when the camera is used on the lower ISO settings.